By Aleksei Anikin, Forgotten Animals Novosibirsk I recently had a conversation with a certain person, that was very revealing in all senses of the word (and in places even epic). The subject was, of course, cellar cats. We each had our basic premise: mine – that cats do not belong in cellars and it’s ACCEPTABLE and the RIGHT THING TO DO to brick up empty cellars (that don’t have any cats in); the opposing view – that it’s fine for cats to be in cellars and we need to get the city to make sure that all cellars (even empty ones) are left open. Sadly, we had to bring our chat to an end because my very reasonable opponent, from his moral high ground, thought that, when his arguments were defeated and he couldn’t find any new ones (and he didn’t want to admit he was wrong), the best tactic for asserting his point of view would be to get personal and change the subject. So, the basic point made was that “it is fine for cats to be in cellars, that’s how it should be + every cellar should have special openings for cats, even if there is not a single cat in”. First argument. Let us imagine that a cellar is empty and has been sealed up. 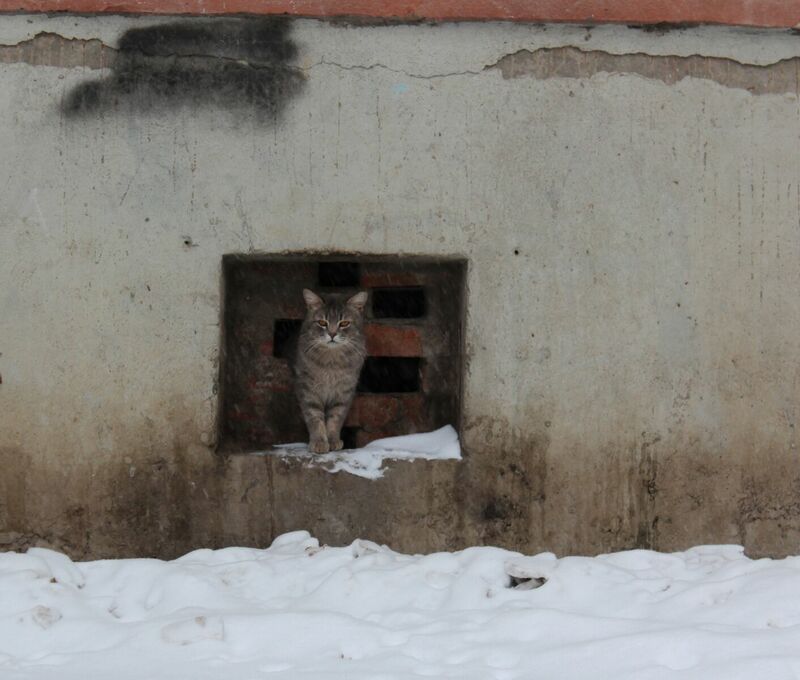 Winter comes, a cat shows up at the building but the empty cellar is all boarded up. What happens next? If the cat is tame (owned, but lost, let’s say), then it can be taken by someone until her owners are found, or at least let into the hallway (garage, shop, whatever). Nobody is going to be too thrilled to have a cat in the hallway of their building, but at least there, people will pay attention and, the main thing is that, for a few days (or so) it will be easy to locate it and, in that time, the owner (if there is one) is likely to be found (lost cats rarely stray far, especially in the cold; you just need to take the trouble to stick up some “cat found” ads in the area). This story ends happily. If the cat is tame but the owner is not around and is not likely to be found and the cat is kicked out of the building. Now we need to act decisively – either take the cat in and keep it (I know, I know, dreamworld) or take the traditional route of spamming animal services with messages full of undisguised moral arm-twisting. Either way, the cat will not perish and she might even be lucky enough to find a home. If the cat is feral then she is unlikely to be from a neighbouring cat-cellar that is, as it were, her permanent residence. We can try letting her in to the hallway to warm up (but she’s likely to run off back to her hideaway) or (here I go off into Utopia again) we can take in, get her used to people and find her a place. What if the cat ends up dying on the street (nobody takes her in or lets her in anywhere)? We can’t rule this scenario out because we seem to be people that can spend several days writing sorrowful posts with a thousand weeping smilies, take snaps of the various stages of the poor cat’s demise whilst doing precisely nothing to save her. And then one morning, when we don’t see the cat (she died during the night and street services have taken her away) we joyfully declare “oh, I hope somebody took her in!” and promptly forget the whole thing like a bad dream. In this scenario, yes, it’s bad. But what is worse – 1 deceased cat or an endlessly reproducing cat family that will, sooner or later, be destroyed in the most inhumane way? Who is to blame here – the sealed-off empty cellar? Or the people who threw the cat out and the people who did nothing to help her even though they had to almost step over her every day? When will the actual person be the one held responsible, not someone else, something else, somewhere else? In the opposite situation, when the cellar is open, the first thing the cat will do, naturally, is to hide there, rather than waiting around for a kind human to come along. And, most likely, nobody will notice this. Until the spring. When the surprised and moved residents behold the young litter of kittens, with bald patches from lice and running eyes, crawling about all wobbly in the fresh grass, and their “happy” mum, emaciated from nursing, from winter and already pregnant again, shaking from weakness, unsuccessfully trying to catch a pigeon to feed her family. Now that’s how things should be, they reckon, that’s humane! On what is humane – one phrase from that conversation: “It’s cruel not to give them a chance to live”. 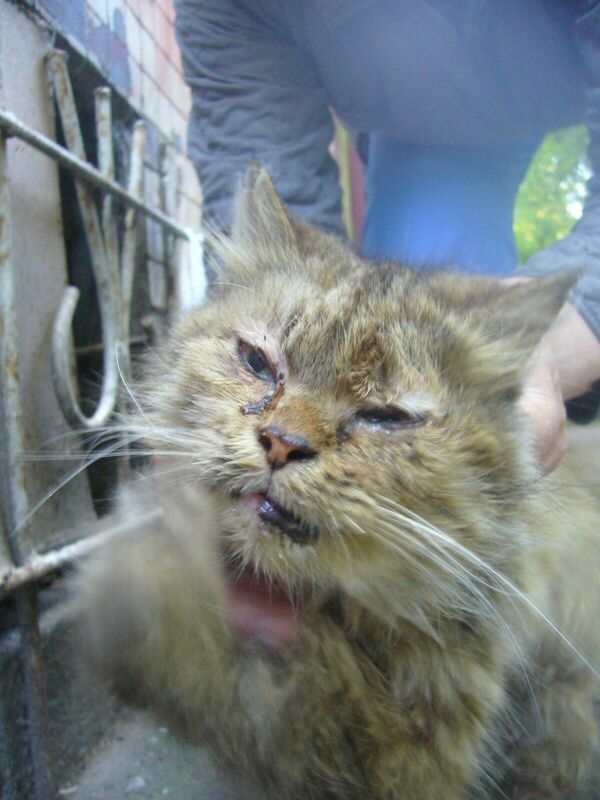 My opponent thought that it was acceptable to sterilise pregnant cats (something that I believe is justified under these circumstances, with such a huge number of strays). But to the question of why, then, these kittens, too, should not be stopped from being born – after all, we are doing the same thing, cruelly not giving them a chance to live – a logical paradox in their thinking was exposed and they went for the best possible option: an abrupt change of subject. Second argument. “If there are no cats there will be rats”. The internet resounds with claims along the following lines: “In Astrakhan (St. Petersburg, Nizhne-Gadyukino, wherever) they’ve solved the stray cat problem and now it’s a city of rats!”. My dear people, please, please, show us the statistics! If there really are, in our long-suffering land, cities that have solved the stray cat problem, I will make a pilgrimage there, on foot, prostrating myself every mile of the way, to find out how they did it. Assuming that it wasn’t a ‘scorched-earth’ policy – the moronic destruction of everything that moves. But I haven’t seen anything to support these claims, unsubstantiated assertions are all there is. An example from my own life. In our building, about 15 years ago, we had an open cellar. But no cats lived down there and the cats from neighbouring buildings wouldn’t set paw in the place. They had been driven out by the rats. These creatures had got so bold that they ran along the path to the bins to feed in broad daylight, until they sealed up the cellar and destroyed everything without a trace in order to put a stop to this. Third argument. “If there are cats, the fleas will live on them and not bother people”. What on earth? Again, let cats offer up their unfortunate bodies to a cloud of fleas, let little kittens be literally eaten alive by fleas, so we aren’t bothered by them? Nevermind that humans are not hosts for fleas; it seems that a lot of people are not up to realising that fleas and lice are different things (lice, incidentally, have a tendency to set up home in flats that are in an unhygienic state). Lots of people know that, at the onset of The Time of the Flea (warm weather), cats really do not like to hang out in cellars. They would rather spend a rainy night shivering under a bush than fall prey to an ever-hungry gang of fleas. What experience shows is very simple: cats will themselves steer clear of places where there are a lot of fleas. And a lack of cats has no effect on the flea population – absolutely none. I have worn myself out writing about what can happen to cellar cats. It’s not just distressing and horrendous, it doesn’t even fit into a human comprehension of torment and horror. But, it turns out, there are people (who think of themselves as animal-lovers) who, in all seriousness, suggest that cats should be introduced to every cellar of every building “to foster a culture in which it’s fine to have cats in the cellar”; such an arrangement should be encouraged in every way possible. They even propose that societies be set up to lobby for this – changes to the law and housing services regulations, letters to the mayor, to Putin, Mao Tse-tung and Pharaoh Ramesses. I don’t even know what to call this. But I know for sure that, were this approach taken, the work that’s been done by me (and many other animal advocates) to clear out cellars would come to naught. Not once, not twice, have I had to return to a cellar that had been completely ‘cleared’ (and then not sealed up) to find a new cat colony there. And half the time this re-population has been caused by old ladies who feed them (people who, just moments before were expl). But how can we chuck them out – we can’t take them home (where we have all of 1-2 cats already) and, well, if there’s nothing living in the cellar, who are we going to feed? The Great Mission would be stalled – and that cannot be allowed to happen! Some cats, indeed, are fiercely feral. And yes, once they’ve been sterilised, I release these wild-eyed things back into a cellar. But that is only because I have no choice. I do believe that any cat can be turned around with enough patience and kindness but, unfortunately, I can’t spend 1-2-3 years on a single cat. I have consciously relinquished that idea so that I can save a larger number of other – tamer – cats. I find it difficult, every time. This is because there is an incredibly large number of cellar cats but we animal-lovers who take care of them are very few. And to blame for this situation are, in particular, those ‘heavenly life in the cellar’ propagandists and the ‘kind’ old ladies who foolishly put out food. Cats are not born hostile to humans! The ones that get that way are the ones born in a cellar. So the more cellar cats there are, the more feral cats there are that it will take effort and time – that we just don’t have – to rehabilitate. So we have to release them, it’s not from some misplaced ‘love of freedom’. And, by the way, on the subject of ‘nature’ – nature, in the city? Right. It’s like virgin forest – the dogs, the cars, the wasteland, the sadistic children and the fur hunters. Let the cats roam free! Oh, she hasn’t come today – yes, of course, they’ve taken her, she’s so pretty, they’ve had their eye on her, Herods! And now for the calls to go the way of “it’s fine for cats to be in cellars, it’s nice for them there”. And so, they say, there’s no need to seal up a cellar, even if it’s empty – let them live there. Cats in a cellar – it’s NOT FINE. Cellars are NOT NICE for cats to be in, they’re HORRIBLE. This just doesn’t seem to sink in – this is the very thing we should not be advocating for but this thinking still prevails. And as long as people don’t see all of the suffering it causes for cats, it’s all the same to them, they’ve got used to not paying any attention to this minor detail. If, for example, they see a cellar cat who has given birth but don’t see the kittens – no, they haven’t “been taken in, lovely little things”: in fact, they have died from a virus or from cold and they are now decomposing in the depths of the cellar beyond where the eye can see … So my opponent was boasting of his ‘cellar refuge’, how there was, he said, an understanding with housing services and the residents, it was all clean and cleared up, the cats had been sterilised, they were living in clover down there. I have to say straight away: this is a rare exception indeed. In this city, such well-appointed cellars (if all that was said was true) can be counted on one hand. 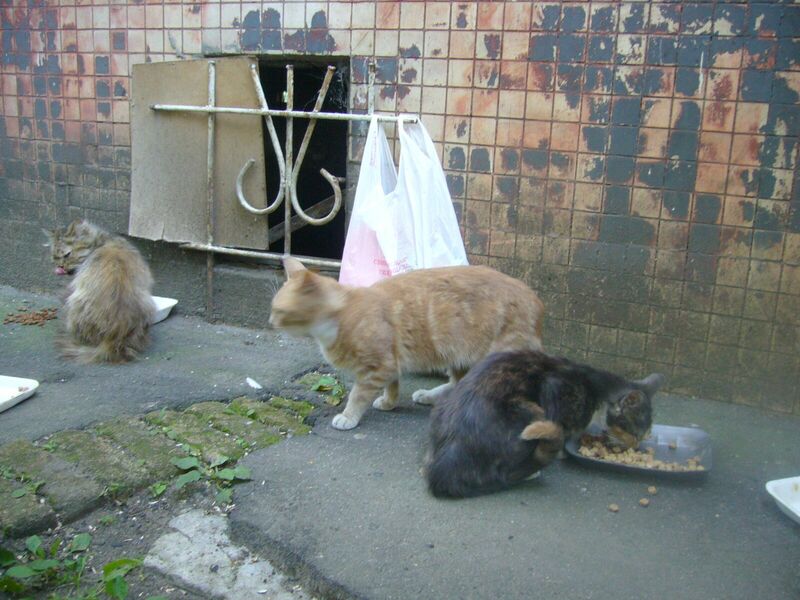 What is usual is quite the opposite – dreadful conditions, unsterilised cats who are reproducing and dying completely uncontrolled, embittered residents, inadequate feeder-grannies and then housing services, with their ‘knock on head and poison’ policy. Is this what they’re fighting for? And this is how it is everywhere! That ‘cellar refuge’ balances on a knife-edge, things can change at any moment and all those 10 cats that have been “protected” by such hard work turn out to have been living under a Sword of Damocles and face a swift and terrible massacre – this happens! Whereas, if a person really wanted to help cats, there simply wouldn’t be any cats in his cellar – over the few years it takes to sort out a single cellar, he could have found homes for all the cats, taming those that need it before they went to their new people. And nobody would be in danger, all of the puss-cats would be sitting at home and the cellar would be shut. The odd lost cat might make an appearance but that can be sorted out. But no, this is not our way! Let them live there, ‘be happy’. But even with such a fantastic ‘cellar refuge’, this person, this pure soul, without a moment’s hesitation, hands the kittens he finds to someone or other to put them in the state-run shelter (as recounted quite calmly on one public forum). Why? Well, because there’s nothing else to do – there are just too many cats. But at the state-run shelter, there are, most likely, other things that can be done. Returning to the question of leaving empty cellars open. There are those amongst us, well, you know the sort – if there’s a hole in a cellar, they’ll chuck a cat into. It’s axiomatic. It’s like some sort of provocation. If a person drops in at a dental surgery that’s all clean and tiled, it wouldn’t occur to him to litter it with seed husks or flick away their cigarette butts. But if a person is walking through a neglected courtyard that looks more like a rubbish dump, it’s as if the arm has a reflex all of its own to rid itself of a superfluous something, even if it’s just a bus ticket (the place is already full of rubbish, after all). Such is the human mind. So an open cellar doesn’t stay empty very long, and then, hey presto, the well-trodden path, another population explosion of cats that nobody wants, left to grow feral. It isn’t nature that makes cats feral, it’s people. Here’s a cat, here’s a hole into a cellar, no need to give it a second thought: “old ladies will feed her” + “it’s nice for cats in cellars” = in she goes! And the person’s conscience is clear, he didn’t kill her. After all, dealing with the consequences – what’s that? He’s not going to put his shoulder into trying to get through a law on the universal sterilisation of non-pedigree cats, work hard to get the public to treat animal-protection as a moral issue, pay proper attention to the ethical treatment of animals– why do we need to do that, right? Better if we get empty cellars to be left open and keep chucking the cats in. Better, that is, that our cities continue to be choked up with homeless cats and animal-loving volunteers toil on in the knowledge that their efforts are completely futile. Only then will everyone be happy, especially the cats. So, to summarise: CATS DO NOT BELONG IN CELLARS! AND IT’S ACCEPTABLE AND THE RIGHT THING TO DO TO BRICK UP EMPTY CELLARS!